Due to you top notch service I have received lately, I would like this in your testimonial section: I was very weary to try working with a mail-in refinery and entrusting them with the decision as to a payout for gold/silver. I have used Northern Refineries a few times so far and I will continue only using them now. Extremely honest, fair, and fast. That says it all. Thank you guys so much and I can't wait to mail in my next shipment knowing you will do the right thing. Stuart, Wow, that was a fast turn around! Always a pleasure doing business with you. I just want to thank you for your great service. It has been a pleasure to do business with you. Thank you again. Hi Stuart! First, I want to apologize for not writing this sooner, but I just wanted to say thank you VERY Much for the personal, First Class Service, and the Honest and EXTREMELY FAST return on our Gold. I mailed it on Thursday, and the check was in my door on Tuesday! Amazing! Feel free to use any part of this in your testimonials, or I'd be more than happy to write one for you if you'd like. It's taking a little while to get things started here, but I look forward to working with you again soon. I hope you and yours are well and have a wonderful holiday! 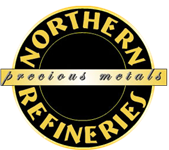 To Whom it may concern, Working with Northern Refineries has been a great experience. Their level of competence and honesty far outweighs any other refinery we have done business with. I personally highly recommend using the above all other as you nwill be treated honestly and fairly. They even answer there telephone! I wish all business had the ethics this business has. Stuart--I want to personally thank you for the excellent service I received with the photographic flake you processed for me. The service was exceptional, and I would gladly act as a reference if desired. Thank you again.